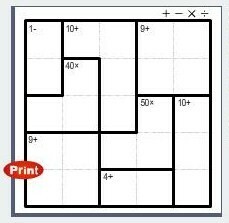 CalcuDoku are math based puzzles coupled with logic. Unlike other logic puzzles, CalcuDoku uses addition, subtraction, multiplication and division in ways which are deeper and more gratifying than anyone can imagine. Following the footsteps of Sudoku, Kakuro and other Number Logic puzzles, CalcuDoku is one more family of easy to learn addictive logic puzzles which were invented in Japan. Using logic together with the four math operations, these fascinating puzzles offer endless fun and intellectual entertainment to puzzle fans of all skills and ages. Sudoku are easy to learn yet highly addictive language-independent logic puzzles which have recently taken the whole world by storm. Using pure logic and requiring no math to solve, these fascinating puzzles offer endless fun and intellectual entertainment to puzzle fans of all skills and ages. Sudoku is a number placing puzzle based on a 9x9 grid with several given numbers. The object is to place the numbers 1 to 9 in the empty squares so that each row, each column and each 3x3 box contains the same number only once. Conceptis Hitori puzzles come in many sizes and range from very easy to extremely difficult taking anything from five minutes to several hours to solve. However, make one mistake and you’ll find yourself stuck later on as you get closer to the solution… If you like Sudoku and Kakuro, you will love Conceptis Hitori as well! Hitori is an easy to learn addictive logic puzzle which was invented by Nikoli Puzzles in Japan. Using pure logic and requiring no math to solve, these fascinating puzzles offer endless fun and intellectual entertainment to puzzle fans of all skills and ages. Hitori : Shade squares so that the numbers don't appear in a row or column more than once. Shade squares must not touch each other vertically or horizontally while all un-shaded squares must create a single continuous area. Conceptis Pic-a-Pix are exciting, language-independent logic puzzles that form whimsical pixel-composed pictures when solved. Challenging and deductive, yet easy to learn and artistic, Conceptis Pic-a-Pix offer the ultimate mix of logic, art, and fun, while providing solvers with many hours of mentally stimulating entertainment. Pic-a-Pix puzzles are based on a grid with a pixilated picture logically "hidden" in it. Using logic, the solver determines which squares are filled in and which should remain empty until the hidden picture is completely exposed. Pic-a-Pix puzzle clues are provided in the form of numbers which are located outside the grid. These numbers are organized on the left side of each row and at the top of each column. Each number represents a filled-in block in its respective row or column, with the value and the color of the number being equal to the length and the color of the block. In addition, the sequence of the filled-in blocks must follow the sequence of the numbers and there must be a space between two filled-in blocks if they are of the same color. Kakuro puzzles come in endless variations, available in almost any grid size and range from very easy to extremely difficult, taking anything from ten minutes to several hours to solve. Make one mistake and you’ll find yourself stuck later on as you get closer to the solution… If you like Sudoku, you will love Conceptis Kakuro as well! Hashi is an easy to learn addictive logic puzzle which was invented by Nikoli Puzzles in Japan. Using pure logic and requiring no math to solve, these fascinating puzzles offer endless fun and intellectual entertainment to puzzle fans of all skills and ages. Hashi is a bridge-connecting puzzle. Unlike Sudoku, Kakuro, Hitori and Slitherlink, Hashi puzzles are solved by connecting islands with bridges according to the rules so that there is a continuous path between all islands. Hashi : Each circle represents an island and the number in each island tells many bridges are connected to it. Conceptis Maze-a-Pix are exciting maze puzzles that form whimsical pixel-composed B&W or color pictures when solved. As the player paints the path from the entry to the exit of the maze, a "hidden" picture is exposed. Discovering a beautiful picture makes the traditional maze concept more rewarding and fun to play. Conceptis Maze-a-Pix puzzles offer a wonderful mix of logic, art, and fun, while providing solvers with many hours of mentally stimulating entertainment. Maze-a-Pix puzzles are solved in the same manner as traditional mazes by finding the true path going from the entrance to the exit of the maze. However, in Maze-a-Pix, the true path is based on a pixilated picture which becomes visible when the puzzle is completed. Conceptis Slitherlink puzzles come in many sizes and range from very easy to extremely difficult taking anything from five minutes to several hours to solve. However, make one mistake and you’ll find yourself stuck later on as you get closer to the solution… If you like Sudoku, Kakuro and Hitori, you will love Conceptis Slitherlink as well! Slitherlink is an easy to learn addictive logic puzzle which was invented by Nikoli Puzzles in Japan. Using pure logic and requiring no math to solve, these fascinating puzzles offer endless fun and intellectual entertainment to puzzle fans of all skills and ages. Slitherlink : Connect adjacent dots with vertical or horizontal lines. Each number indicates how many lines surround it. Copyright © 2007-2012 Hoverdia. All Rights Reserved.